Wrapping jewelry, such as a necklace is difficult because the piece is so small. A full-size gift box is too large and may overwhelm the necklace or it may even become lost. When you purchase jewelry as a gift, look for creative ways to wrap the gift. Gift wrap a necklace in something traditional or something completely unexpected. Place a small piece of cotton batting on a table. The batting serves as the protective backing on the necklace and keeps the jewelry from getting scratched or otherwise damaged. Lay the necklace on top of the cotton batting and wrap the cotton around the necklace. Secure with a small piece of tape. 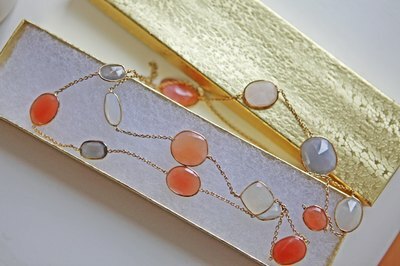 Set the cotton-wrapped necklace inside a small gift box, such as one specifically made for jewelry. Once you put the lid on the box, wrap in one shade or pattern of wrapping paper. Wrap a small piece of ribbon around the box. Put this smaller box inside a box that’s slightly larger. 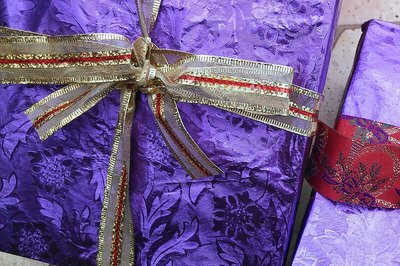 Wrap that box in a different color of wrapping paper and place inside a larger box. Keep placing the boxes inside bigger boxes and wrapping until you have a larger gift that will surprise the recipient. 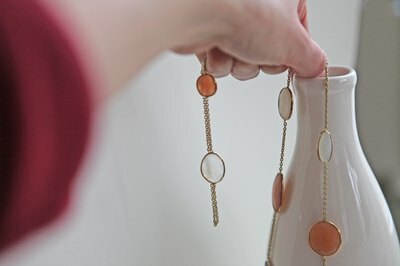 Skip the cotton batting step and instead, run a small piece of ribbon through the necklace. Thoroughly wash a glass bottle, such as a wine or champagne bottle. Drop the necklace into the bottle, keeping a small length of the ribbon outside the bottle. Insert a cork and wrap as usual. The cork keeps the ribbon in place and keeps the necklace from falling out. 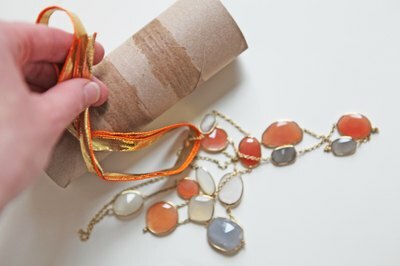 Slip a piece of ribbon through the necklace and then slide the piece through the end of an empty paper towel roll. Bring the ends together at the middle of the holder and tie off. Fill the paper towel roll with confetti and place a few pieces of tape at each end, which keeps the confetti from spilling out. Cover the roll with wrapping paper. Any type of small container serves as a box for your necklace. Look for aluminum boxes, metal tins and even hollowed-out books.